For Kindle owners, Hennie’s e.book edition of His Call, My All is now available for download. I would recommend this book to anyone, it’s a easy read that will touch hearts hungry for God. Enjoy it! He is the Real deal and The MOST Amazing adventurous life!! You get to see the African conflicts resolved in unity and peace that you will Never hear in the News. WOW! I’ve known about Hennie Keyter for a long time, but now I feel I know him! The very gifted author/s took me right into the stories as if I was there – I could see the miracles, hear the worship, feel the presence of God, touch the people and smell the sweat! This is not just another biography, this is the powerful, true story of a humble, obedient man who is still giving his all to the call of Father God! An uncomplicated, undiluted gospel message taken to a heartbreaking, desperate and violent world, bringing truth, salvation, hope and freedom! Masterpiece! It’s not always easy to follow God. Hennie Keyter shows the ups, downs and uncertainties he faced in the midst of the joy of hearing God speak to him. I was very blessed to read his story. I believe God still uses the gift of healing today, even though I have never personally seen the gift used by God. Three pastors in a row told me years ago there was no Holy Spirit, but I didn’t believe them. Their evidence was that if there was still the Holy Spirit working, God would have given them the gift of healing because they asked and they worked so hard for him. I love that Hennie knows we can never earn this gift. He cherishes what God has given him and everything he does is for the Kingdom of God. That inspired my heart. When he did wrong, he repented and continued with God’s work. In addition, Hennie’s parents still died. People still died around him. The baby he heard take its last breath was heart wrenching. Hennie didn’t have the power within himself to heal anyone apart from God’s will to heal. His mission is about bringing salvation to the world and that the world would see and hear God themselves. Wonderful! I’m so glad I read this book. Thanks also to coauthor, Janet Rodriguez, for mentioning this book to me. It was very well written and every chapter was meaningful. 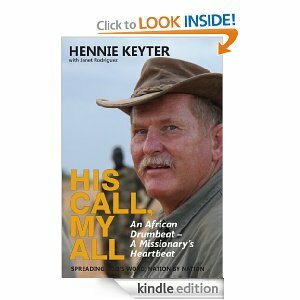 I am so glad Hennie Keyter wrote his story! It is an amazing account of a man who has given himself to the call of God and has remained faithful to it all the years since he was a young man. It is a faith builder and illustrates that the impossible is possible with God. I also commend his wife Rita as they are a team; he went and she stayed but their giving is the same in my opinion. I have a deep love for Africa and it’s people so I read the book in two days as I found it hard to put down. The brave and courageous put their faith into action.